The Coca-Cola company has recently announced, to much fanfare, a three-year, US$20 million partnership with the World Wildlife Fund on water conservation. At face value, such an announcement is obviously welcome. After all, who would object to water conservation projects in a world where over 1 billion people still lack access to clean drinking water? But the announcement by Coca-Cola deserves scrutiny - something sorely lacking from the media and even NGO's - primarily because it is the Coca-Cola company that is announcing water conservation projects. As the India Resource Center has established, the Coca-Cola company has an extremely unsustainable relationship with water, a precious and increasingly scarce natural resource. The company's insatiable thirst for water - the company used 290 billion liters of water in 2006 alone, enough to meet the entire world's drinking water needs for 10 days - does not even begin to tell the whole story. 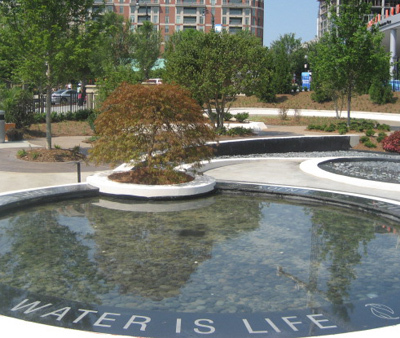 The Coca-Cola company converted two-thirds of the freshwater it used into wastewater. The company used the vast majority of the freshwater it uses for cleaning in its production process, and the result is that the Coca-Cola company is a champion of turning perfectly fine (and increasingly scarce) freshwater into wastewater. Such an abusive relationship with water is downright criminal, particularly coming from a company that describes itself as a "hydration" company and whose annual environmental report reads like a grant proposal from a group working solely on water conservation. Credit Goes to India but No Credit for India? It is in India where the company's abuse of water resources have been challenged vociferously, and communities across India living around Coca-Cola's bottling plants have organized in large numbers to demand an end to the mismanagement of water. In fact, it is the Indian-led campaigns against Coca-Cola that have forced the company to announce the ambitious $20 million initiative. The campaigns from India have managed to significantly dent Coca-Cola's "refreshing" image, and as the Wall Street Journal put it, "cost it millions of dollars in lost sales and legal fees in India, and growing damage to its reputation elsewhere." In a frantic effort to repair its increasingly blemished image as a result of the campaigns from India, the Coca-Cola company is rapidly championing corporate social responsibility, and the US$20 million project with the World Wildlife Fund is no different. 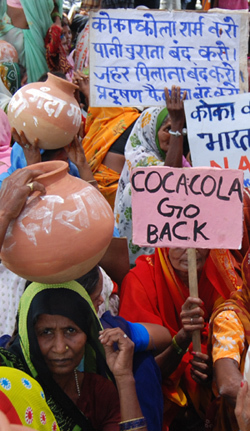 For the communities in India struggling against Coca-Cola's misuse of water resources, however, the announcement falls way short of what is required of the Coca-Cola company. First and foremost, the Coca-Cola company must adopt fundamental operational changes in the manner in which it operates in India. So far, the company has chosen to respond to the charges in India through its formidable public relations machinery, and no amount of "spin" will make the problems go away. Secondly, the US$20 million partnership with the World Wildlife Fund, ostensibly to conserve river basins, does not include India. While many are grateful that India is excluded from their list, it is also befuddling that the company has chosen to ignore the country where it has arguably done the most harm to water resources. While it is too early to begin to analyze the working partnership between Coca-Cola and WWF, it is clear to the communities in India that the company is not genuinely interested in fixing the problems in India that are affecting the lives and livelihoods of thousands of farmers and low-income, rural communities in India. If the company were to be serious about the problems in India, it would invest time, resources and energy (and not its public relations department) to deal with the very real issues in India. The Coca-Cola company is still stuck in the mode that somehow the problems in India will go away, maybe bolstered by the fact that they can buy any and all Bollywood personalities to do their bidding in India. If Coca-Cola's announcement of the $20 million project is the result of the major blow that the Indian communities continue to inflict on the company's image, what is the company doing investing resources to conserve water with the World Wildlife Fund everywhere but in India? One doesn't have to look very far to understand some of the real motives of companies such as Coca-Cola in announcing such grandiose plans as part of their corporate social responsibility. Golden Peacock or Red Herring? The Coca-Cola company in India wastes no time in letting visitors to its websites know that it is an award winning company, and a leader in environmental practices worldwide. One of the most "prestigious" awards conferred upon the Coca-Cola company repeatedly is the Golden Peacock Environmental Award. The Coca-Cola company has bagged these awards for various "excellent" performances in 2001, 2002, 2004, 2005 and 2006. The awards are conferred upon the Coca-Cola company by World Environment Foundation, a non-profit organization registered in the UK and in India. What the Coca-Cola company does not mention, however, is that the Coca-Cola company is the sponsor of the World Environment Foundation. In fact, if the homepage of the World Environment Foundation is to be believed, the Coca-Cola company is the ONLY sponsor of the World Environment Foundation! Sure it is convenient to have a group that Coca-Cola sponsors confer all types of environmental awards to the Coca-Cola company. But it is disingenuous, and it is an attempt by the Coca-Cola company to manufacture a public image of itself that it clearly is not. The Coca-Cola company's practices in India have come under intense scrutiny as a result of the campaign, and one of the most significant proponents of the campaign are students at colleges and universities in the US, UK and Canada. More than 20 colleges and universities have taken actions against the Coca-Cola company for their egregious behavior in India, and just in the last six months, the University of Manchester in the UK, University of Guelph in Canada and Smith College in the US have rejected Coca-Cola products on campus. One of the more significant campaigns against Coca-Cola took place at the University of Michigan, a prestigious, public university with over 40,000 students. On January 1, 2006, the University of Michigan suspended its business relationship with the Coca-Cola company as a result of the student campaign on campus and placed certain conditions for its return. One of the conditions placed on the Coca-Cola company was that it must agree to an "independent, third party" assessment of its operations in India. Coca-Cola offered, and the University of Michigan accepted, the "independent, third party" assessor of its operations in India, a group called the Energy and Resources Institute (TERI). TERI, however, is funded and sponsored by the Coca-Cola company, and enjoy a long-standing, mutually beneficial relationship. Defying all logic, the University of Michigan had agreed to a group funded and sponsored by the Coca-Cola company to assess Coca-Cola's operations in India in an "independent, third party" manner. TERI has named Coca-Cola as among the most responsible companies in India in 2001, has organized Earth Day 2003 with the support of Coca-Cola, and its president, in a video produced by the Coca-Cola company to address the campaign, has already announced that the Coca-Cola company "is on the right track" in reference to the problems in India. Once again, the Coca-Cola company has found a disingenuous way to get the results it wants - a positive assessment of its operations in India. 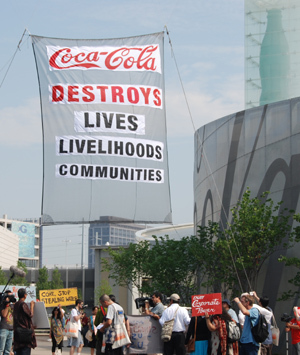 The communities in India, while also calling for an independent assessment, have rejected the choice of the Coca-Cola sponsored TERI to do the assessment. Rainwater Harvesting or Tall Claims? In response to the growing Indian campaigns against Coca-Cola, the company has decided to promote rainwater harvesting - a traditional Indian practice - in and around its bottling plants in India. Touting rainwater harvesting initiatives is now central to Coca-Cola's public relations strategy in India. Although new to introduce rainwater harvesting projects, the Coca-Cola company does not shy away from making fantastical claims. In one of their websites the company claims that "a substantial amount of the groundwater we use in our operations is returned to groundwater systems, thereby helping to replenish groundwater resources." However, when asked to back up the claims of "substantial" amounts of groundwater that they recharge, the company does not offer any. During a protest at one of the company's bottling plants in Mehdiganj in north India, villagers were successful in cornering Senior Manager of Public Affairs & Communication at Coca-Cola India, Mr. Kalyan Ranjan. When asked how much rainwater was harvested in their bottling plant in Mehdiganj, Mr. Ranjan announced that 7 million liters of water was harvested in 2005. Even taking a conservative figure of 250,000 liters of water per day that Coca-Cola extracts for the Mehdiganj bottling plant, the recharge figure given by the Coca-Cola company comes out to be 8%. That is, the company recharged only 8% of the water that they extracted from the groundwater resource. Does 8% equal "substantial?" Hardly. Once again the Coca-Cola company has chosen to mislead the public at large about what it really does by making fantastical claims about the efficiency of their rainwater harvesting programs. Putting Your Money Where Your Mouth Is or Mouthing Off? For a company that has an annual advertising budget of $2.4 billion, an investment of $20 million in a global water conservation project - less than 1% of its advertising budget alone - is truly a drop in the bucket. In fact, it would not be unrealistic to wager that the Coca-Cola company will spend more on advertising its water conservation efforts than on the water conservation projects itself! And for a company with a market capitalization of $100 billion, the sincerity of Coca-Cola's investment in water conservation becomes even clearer. The company is investing 0.002% of what its worth and we are to take it seriously? Given the Coca-Cola company's past record of manufacturing an image of itself that it clearly is not, we remain extremely skeptical that the current announcement to conserve water is anything else than another attempt to do just that - greenwash. The 10th edition of the Concise Oxford English Dictionary defined greenwash as "disinformation disseminated by an organization so as to present an environmentally responsible public image." Amit Srivastava is the coordinator of India Resource Center, an international campaigning organization working to challenge abuses by multinational corporations.